I honestly didn’t even know this movie existed until a friend recommended that I watch it. It slipped completely under my radar and, before watching it, I hadn’t seen a trailer, didn’t know what the plot was about, I didn’t even know who its lead actors were. I’m really grateful that my friend recommended it because it’s such a sweet movie and a real tear-jerker. Okay, basic plot: Paige (Rachel McAdams) and Leo (Channing Tatum) are newlyweds who are madly in love. Both are humble, free-spirited people with careers based in the arts – Paige is a sculptor and Leo owns a record studio. Their idyllic life comes to a screeching halt when the couple is involved in a car crash. Paige falls into a coma for several weeks and when she wakes she has lost all memory of Leo and their time together. Paige’s mind reverts to the state it was in just before she met Leo when she was a much different person – a well-to-do law student, engaged to another man. Against all hope, Leo must now try to rekindle his relationship with the stranger his wife has now become. Yeah, it’s pretty much 50 First Dates but so much more sincere and smarter. It’s actually strange that this movie slipped through the cracks and I didn’t get the opportunity to see it, let alone, not know it existed at all. Just looking at it’s box office take, this movie was a phenomenal success, making 196 million dollars off a budget of 30. It’s so strange that I didn’t know about this movie, a movie that popular would have had trailers and posters everywhere as well as a lengthy cinematic run. More than that, The Vow is a quality movie so you would think one of my friends would have recommended it to me sooner. Maybe I forgot about it, maybe I just didn’t want to watch it; either way, I’m glad I finally got to see it. I’m a real sucker for romcoms and this is a really novel approach to a romcom. The movie essentially starts at the end with our two heroes living their happy-ever-after and then moves backwards deconstructing their love in order to recreate it. The fact that this movie is inspired by true events makes its story all the more profound. Thinking that the person you love isn’t lost, hasn’t lost interest in you but has completely been erased is heartbreaking. How do you move on from something like that? Can you even move on from something like that? I loved the way this movie tackled questions like that. The story is handled with extreme care and has this great genuine feel to it. It doesn’t feel like a big Hollywood romcom with overly extravagant and elaborate moments but rather like an Indie, art-house picture where the story (and not sensationalism) is king. 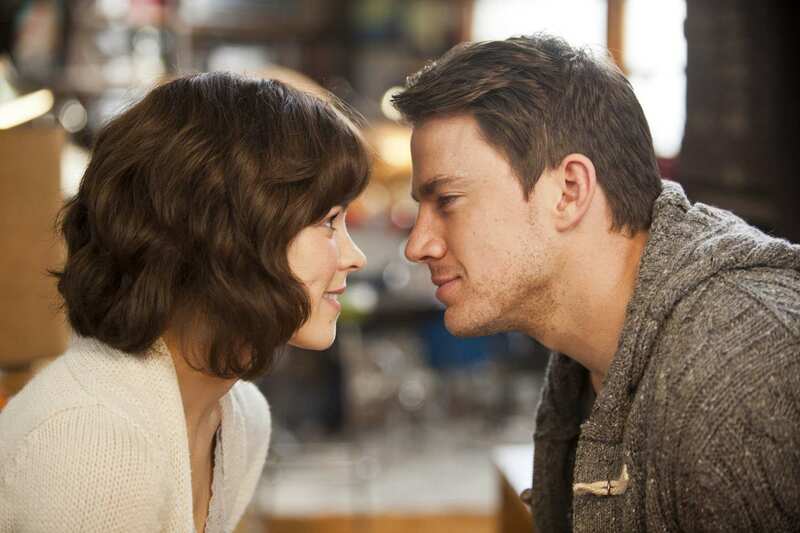 Chaning Tatum and Rachel McAdams do terrific jobs as this movie’s leads. Tatum perfectly portrays the sorrow and helplessness that his character is feeling and provides the audience a hero that they can get behind and root for. I’ve long being a fan of McAdams and think she has everything necessary to be a leading lady and she displays all of this to perfection in this role. She has to play two versions of the same character and does a great job distinguishing law student, uptight Paige from carefree spirit, sculptor Paige. The two also have great chemistry with each other and it’s this chemistry that really makes this movie worth watching. This one reminds me of Random Harvest with Ronald Coleman and Greer Garson. The writer of Save The Cat (on screenwriting) said something on the order of there being only so many stories in Hollywood and that they’re re-incarnated as variations on recurring themes.